Ryorin's Ramblings: New, From Japan: Ordinary People! People are the same the world over. This is something I'm reminded of more and more everyday I'm in Japan. I'm currently staying with a family with two small children: a six-year-old boy and a four-year-old girl who remind me way to much of my childhood and my younger siblings. The little boy loves Dragonball Z, a show my older brother and I grew up watching. It was my favorite show for most of my childhood. 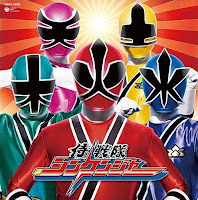 He also loves Samurai Sentai Shikenger,"the current incarnation of the super-hero franchise that spawned Power Rangers, one of my little brother's favorite shows. Today, he was wearing a T-shirt that looked like the uniform of the leader of said super-hero team and reminding me for all the world of the Ninja Turtle uniform T-shirt my older brother had when he was six and the Ninja Turtles were our favorite super-hero team; it also reminded me of the Spider-man (or Spider-girl!) uniform shirt sitting in my drawer right up the stairs. I noticed him wearing that shirt and playing with toy cars with his friends(just like I and my brother did when we were little) while I was drinking coffee and visiting with some friends of my host-mom. It came up that I like science fiction and one of the women instantly asked about Star Trek and started explaining the sequence of the series in the franchise to her friend next to her and talking about how she liked the "Picard Era" best (as in Next Generation, but with the word as in "Warring States Era" or "Showa Era." It was pretty cool.) Then we talked a bit about Stargate (another show we both appreciate) and then the movie Men in Black came up and all five of us forgot Will Smith's name at the same moment ("Isn't he that comedian guy? The one with the fat suit in that one movie?" "No, wait, that was Eddie Murphy..." "Wait, wasn't he in a movie with Jackie Cha- no, that's Eddie Murphy again..."). Five minutes later, after the conversation had switched topics a few times, I finally remembered his name and everyone exclaimed an equivalent of "Oh, yeah! Will Smith! Of course!" It was pretty much the definition of a normal conversation (in my book, anyway, which may or may not count). The little six-year-old boy in my host family will sometimes make a bunch of random noises and ask what that meant in English, just like six-year-old boys in America will make a bunch of random noises and ask what it meant in Japanese or Chinese. The four-year-old girl here acts like any four-year-old in the U.S. would and watches cartoons that my little sister would probably enjoy. Heck, both kids here like "Sponge Bob," a cartoon that I know for a fact my little brother and sister like. I can't help but think that my little brother and sister and the tykes of this house would get along famously. I mention these things because it's so easy to forget how similar people are when superficial differences are so plentiful. As a student of the Japanese language and as a geek interested in Japanese culture, I've been hearing about how clean and safe Japan is compared to America and how everthing's so much more expensive (this is not technically true; manga and Gundam models are significantly cheaper here, though most everything else is pretty spendy) for a long time. People always seem to want to emphasize the different, whether it be in household customs, forms of transportaion, or comic book publishing (I would like to point out that despite a very different process of comic-creation and publishing here in Japan, and stylistic differences, Japanese and Western comics have a lot in common, but I'll go into this another time). It's very easy to get a mental image of Japan as a magical wonderland, separated from the rest of the world. It's not. Japan's part of the real world, too. I've seen people run red lights here. I've seen a guy toss garbage out his car window. I've sat on the train in the morning and heard a high school girl's shock and dismay when her friend mentioned that there was a kanji test that day (I mean, who hasn't forgotten about a kanji quiz or seven?). I've seen kids get excited while talking about their favorite super-heroes, and siblings fight over who gets the caramel-filled chocolate instead of the one with nuts, and highschoolers wait until the last minute to get on the train platform so that they can read one more chapter from the comic magazine sitting at the news stand at the train station. Yes, customs and demographics and crime-rates are different here than America, but the people are fundamentally the same. This I find incredibly comforting; yes, even the litter.